"When people want transportation, they want it now." 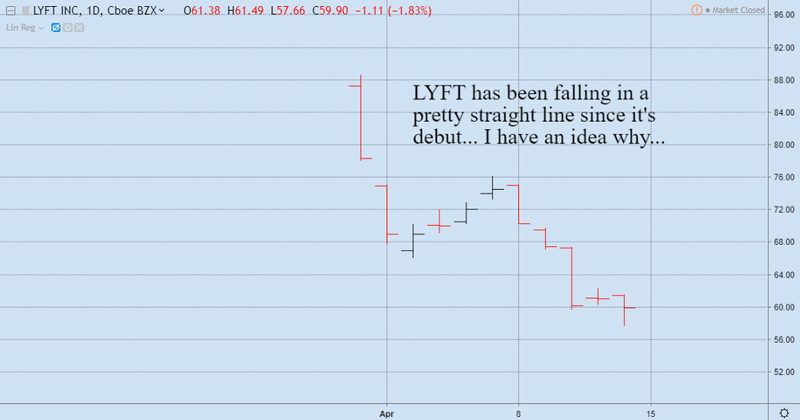 LYFT went public on March 29, 2019 at $72 per share. It opened for trading north of $87 but immediately succumbed to selling to close at $78. North of the IPO price, but well below the opening price. 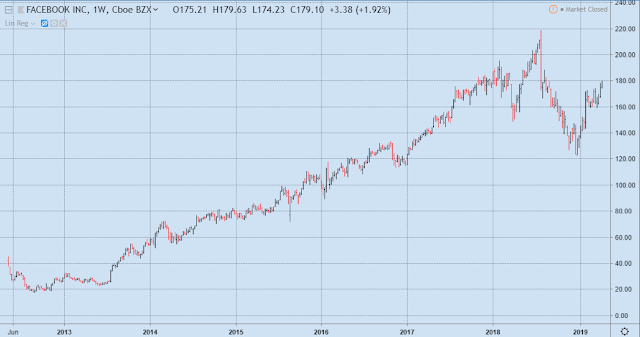 The stock went on to fall to around $68 over the following days... rebounded to $76ish... but closed this past Friday 12 April 2019 slightly below $60 per share. The much longer answer is you don't need to know WHY the stock is falling to profit from it. And no, I'm not suggesting you get short. The smart money did that before the IPO (yes it's possible) and on Day 1. You can make money from LYFT as a long-only trader. Here's how. .. Relax... the stock is not likely going to zero. LYFT is not yet profitable, but neither is SNAP and folks still buy that piece of nonsense. 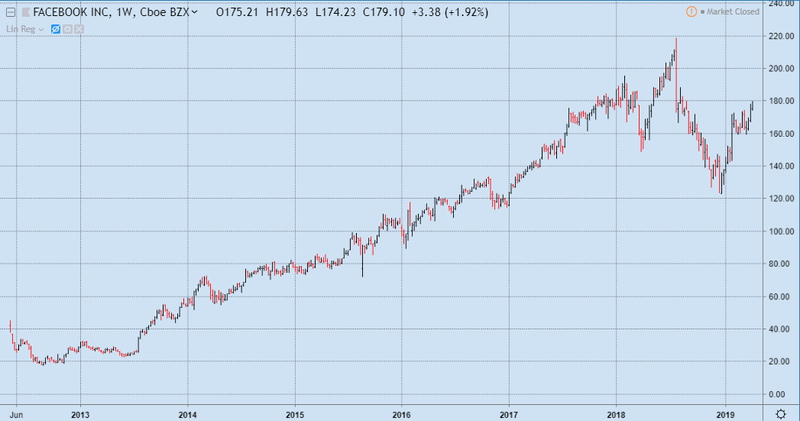 Switch to a longer term (weekly to monthly) chart of LYFT... As long as the stock continues making new lows on that longer term chart, do nothing. HOLB: When LYFT breaks the high of the previous bar without having broken the low of said bar, you buy. This is called a HOLB [High of Low Bar] entry tactic and it's one of the oldest, simplest, easiest ways to get into a position. I cover "how much" to buy in a different post, but suffice it to say, it's good rule of thumb to limit your exposure to less than 3% of your account on any trade idea. 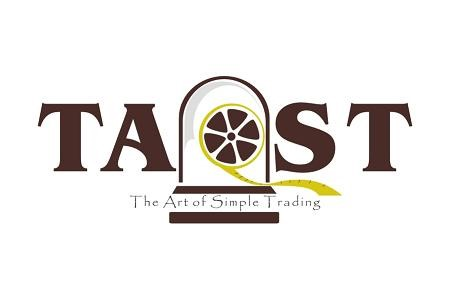 Stop: Once in the position, place a stop loss order a bit below the all time low of the stock. If LYFT trades at your stop price, you should exit the trade automatically and wait for it to set up again. DO NOT TRY TO AVERAGE LOWER BY BUYING MORE AT LOWER PRICES. This is called a Martingale Strategy and it's a bad idea. Re-entry: If you're forced out, watch for the setup to reoccur, and take it again. Where To Exit: Another good rule of thumb is to exit swing trades at 3 to 5 times your risk. If you do that systematically, your win % can be less than 50% and you'll still be profitable. 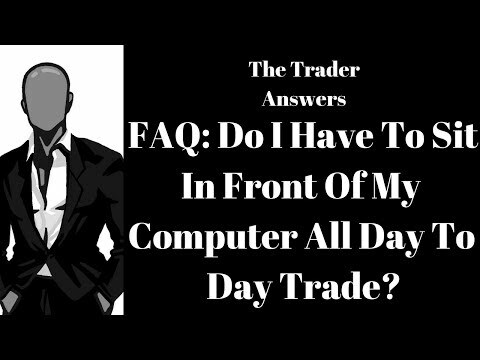 If you want to hold this stock for longer (i.e., portfolio trading style), just decide how to systematically trail your stop up behind the current price. This probably seems like a lot, but I promise, if you get the process down, you can apply it across any number of names (IPO or not) and do quite well. I applied this approach to FB for subscribers several years ago and many folks made good money... Here is the original entry call and here is an update to the call. A couple of the portfolio traders are actually still in the stock. The point here is you can make money from a trade in LYFT... if you do it correctly.